Traditional lighting systems generally use halogen, fluorescent, metal halide or mercury vapor technologies, which are all high in energy consumption, require more maintenance, and have a far lesser life span in comparison to contemporary LED lighting products. Older technologies tend to have significant reductions in light output over time, often losing as much as 30% in the first year of their operation decreasing further over time. 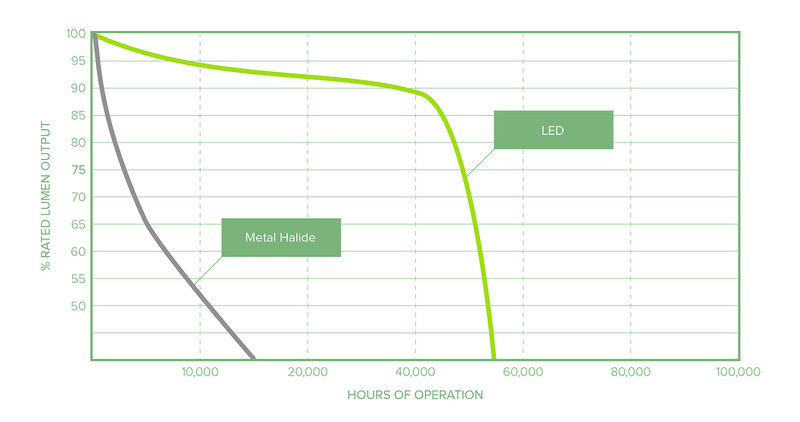 LED light technologies hold their light output levels for much longer than their traditional counterparts ensuring brighter light, for longer. By upgrading to newer more energy efficient LED lighting technology, you can save thousands on power bills and maintenance costs, while at the same time improving the brightness of your shop, warehouse, strata building or carpark. Improve the lighting levels of your premises, save money on power, and reduce your carbon footprint at a fraction of the typical cost of a lighting upgrade, and with little disruption to your business. We think that’s a good enough reason to upgrade with Maxee. Get in touch with us to arrange a free assessment of your current lighting system, and join the thousands of businesses taking advantage of the generous government incentives currently available in Victoria. Your obligation and hassle free assessment and quotation is just a phone call or a click away.